When Japanese firm DMG MORI announced in July that it would relocate its North American headquarters to Chicago, the move confirmed what many business leaders already knew: Illinois is a global leader in foreign direct investment. With 1,800-plus foreign companies operating in Illinois, generating over $100 billion in FDI projects, the momentum of global deal flow is clearly on Illinois' side. "We have a strong support network for international companies. We have over 100 trade-based organizations, and we have tremendous connectivity through O'Hare and Midway international airports," says Andrea Zopp, president and CEO of World Business Chicago. "With 200 direct international flights a day, no other place in the country can compete with what Illinois has to offer foreign companies." More than 80 international consulates are based in Illinois. More than 40 distinct ethnic communities have a population of at least 35,000 or greater in Illinois. 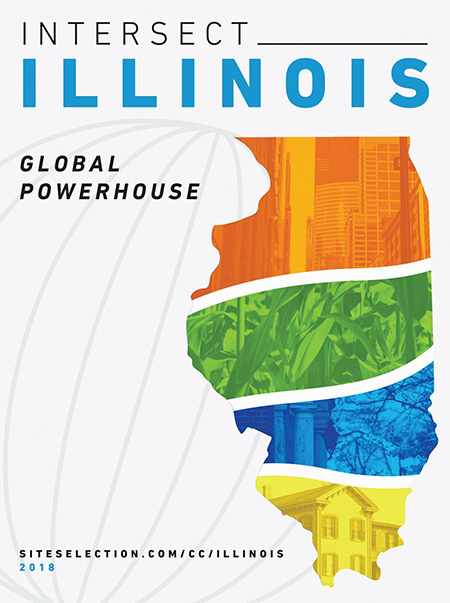 Of the 1,800-plus foreign firms that call Illinois home, many are household names such as Novartis, Ricoh, Bombardier, Siemens and BP. Illinois ranks No. 5 in the U.S. for number of employees supported by U.S. subsidiaries of foreign-owned companies. Illinois boasts eight Foreign Trade Zones. The top countries for FDI in Illinois are the UK, which supports 63,564 jobs in Illinois; Japan, which supports 47,232 jobs; and Germany, which accounts for 36,702 jobs. Canada ranks fourth with 36,143 jobs, while France ranks fifth with 20,018. Intersect Illinois recently helped welcome the newly appointed Japanese Ambassador to the United States to Illinois on a visit that focused on furthering the state's business ties to Japan. Shortly thereafter, DMG MORI, which provides innovative machine tools to customers worldwide, selected Chicago for its new North American headquarters. "Manufacturing is written in Chicago's DNA, and today the sector is running on all cylinders," Chicago Mayor Rahm Emanuel said. "Thanks to world-class institutions like Illinois Tech and global companies like DMG MORI, we are creating jobs today while ensuring the future of manufacturing in Chicago is even stronger than its past." On that same day, the 2018 IBM Global Locations Trend report revealed that, for the sixth year in a row, Chicago leads the U.S. in FDI. The report also noted that Chicago has risen a spot to enter the top five cities globally in FDI. Chicago ranks first in North America in FDI and trails only London, Paris, Singapore and Amsterdam-Rotterdam in terms of the total number of FDI deals worldwide. "Chicago has ranked as the top city in North America for the number of significant foreign investment projects for six consecutive years," said Roel Spee, global leader of IBM-Plant Location International. "Along with rising this year to a top five global ranking, this reinforces Chicago's position as a prime city for global investment." While Chicago is America's top global hub, it is not the only place in Illinois that consistently attracts FDI. As the corresponding map on page 25 shows, Illinois' expansive FDI network is spread statewide. Virtually every county in Illinois has at least one foreign-owned business operation, and most counties have more than one. Intersect Illinois notes that 40 percent of its active projects in the pipeline are of foreign origin. And with recent trade missions to Tokyo, China, Poland and Germany, Intersect Illinois anticipates landing more FDI deals very soon. "The bottom line is that we have the infrastructure and we have the base of talent that international companies need to be globally competitive," says Zopp. "That is why companies from around the world are coming here. We have the number one law school and the number one business school. We have over 140 languages spoken in our public schools. We have a very strong ethnic and immigrant community. And this is a great place to live." Illinois regularly strikes agreements with other countries and cities abroad to further business ties. "We have agreements with Mexican cities and with London and Tel Aviv," says Zopp. "A company from Ireland is looking at us right now. We will build on these relationships, and as we do, more FDI projects will end up in Illinois." The China Chamber of Commerce will hold a large meeting this fall in Chicago, ensuring that Chinese business interests get a closeup look at what Illinois has to offer. "When companies come from other countries, they want to feel comfortable," says Zopp. "We make sure they feel that way. We are very welcoming."